Independent Shakespeare Co., presenters of the Griffith Park Free Shakespeare Festival, has announced its Fall/Spring Studio Season, which includes the premiere of a new adaptation of Edmund Rostand’s classic, Cyrano de Bergerac, the return of A Christmas Carol, performed – with a little artistic license – by David Melville, and a studio-exclusive production of Shakespeare’s Romeo & Juliet. Tickets for all shows are available online at www.iscla.org. Cast: Kevin Angulo, Claudia de Vasco, André Martin, Sean Pritchett, and Amy Urbina. Dazzling humor, soaring romance and thrilling sword-play are the hallmarks of Rostand’s most famous work. In this entirely new adaptation, seven actors bring the theatricality and panache of Rostand’s masterpiece to the Studio Stage. Based on an adaption author Charles Dickens made of his famous Christmas story and performed by David Melville, this L.A. tradition is back for the holidays as Melville recreates the experience of a public reading of A Christmas Carol, given by Dickens himself. Athletic staging and visually rich design create a world of adolescent longing, joyous love, and dire consequences. 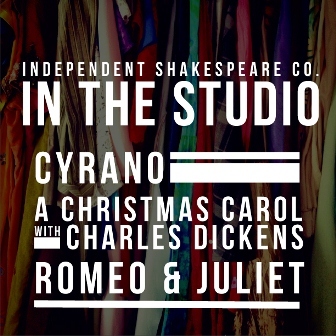 This intimate production will play for the public exclusively in the Studio.